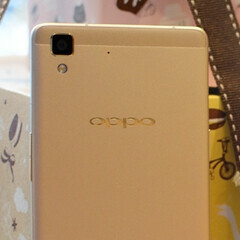 Oppo this week introduced a new Android smartphone called R7 Lite. Design-wise, the new handset looks just like the Oppo R7 that's been available since earlier this year, but a few of its features are different. As its name suggests, the R7 Lite is a downgraded variant of the original R7. The new smartphone sports a 5-inch display with just 720 x 1280 pixels, instead of 1080 x 1920 pixels like on the regular R7. Moreover, instead of having 3 GB of RAM, the R7 Lite only offers 2 GB. Another difference - this time a positive one - is that the Oppo R7 Lite runs Color OS 2.1 based on Android Lollipop, while the regular R7 was released running Color OS based on Android KitKat. Like the slightly older R7, the Oppo R7 Lite is built around a metal frame, it's only 6.3mm-thin, and is powered by an octa-core Snapdragon 615 processor. The handset also features LTE, dual SIM support, 8 MP front-facing camera, 13 MP rear camera, 16 GB of expandable internal memory, and a 2320 mAh battery. While Oppo is listing the R7 Lite on its global website, for now the handset seems to be available only in Indonesia, where it costs arout $279 (about $100 less than the R7). Would you buy one? Besides the R7 and R7 Lite, Oppo is also offering an R7 Plus, which sports a 5.5-inch 1080p display, and can be pre-ordered starting at $499. Oppo price were too high. If I'm gonna spend $499 (R7 Plus), I might buy Galaxy Note 4 (better screen, better CPU), which is US$450. or perhaps the OnePlus Two or Moto X Play/Style. Old news? It was launched 2 months ago in Malaysia.